By popular demand, Namco have localized their well received RPG Tales of Hearts R for a North American release, and have recently detailed bonuses for those who have pre-ordered the game prior to its November 11 launch on the PlayStation Vita. Pre-orders of Tales of Hearts R will include the game itself and a set of six classic Tales of costumes that pay tribute to previous games in the series. This offer also extends to the digital download version of the game, but will only be available till the end of November. 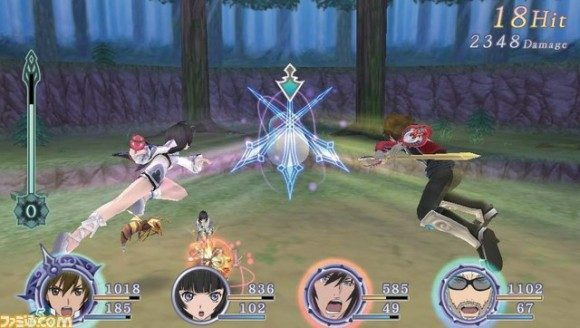 Tales of Hearts R is a remake of 2008’s Tales of Hearts, which was released on the Nintendo DS. It features full voice acting for the main campaign, new characters to play as, 3D graphics and new anime cutscenes. The game was released for the PlayStation Vita in Japan in March last year, but heavy demand for an English version convinced Namco to release it in the west as well. This localized version will retain the original’s Japanese voice acting, at the behest of fan request, but will have subtitles in English and other languages. 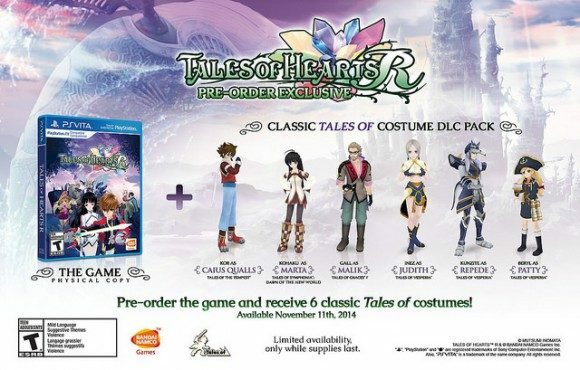 Tales of Hearts R will be out on November 11, and will be compatible with PlayStation TV as well.